It was always going to be a challenge to see Berlin in under 24 hours, but that’s what I set out to do with friend Adam as a guide. My request was slightly unusual- I wanted to see a green Berlin, the kind of places that I would escape to if I lived in the city myself. As one might imagine, this involved a LOT of walking. I arrived as the sun was going down, and an evening stroll from the train station allowed us to escape many of the crowds at the main attractions as we walked from the station past the Bundestag, the Holocaust Memorial, the Brandenburg Gate, the Berlin Cathedral (Berliner Dom) and Alexander square. 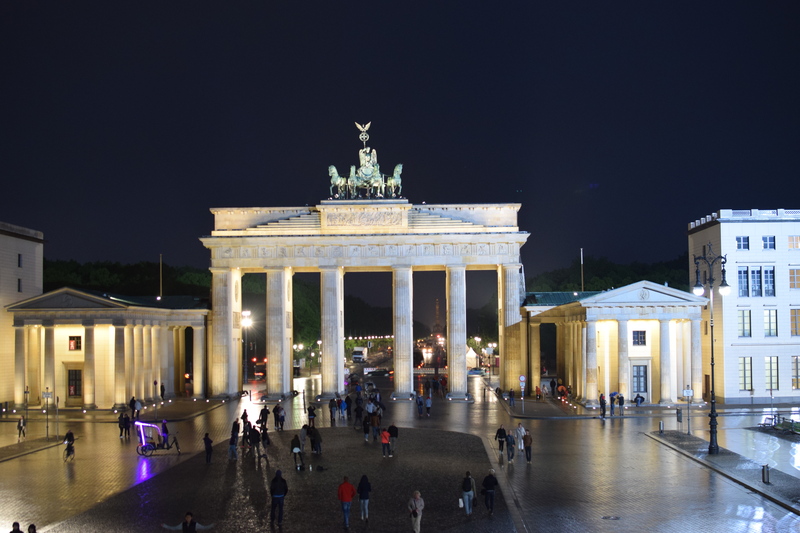 Although none of this was extraordinarily ‘green’, these are the hallmark sights that we felt cannot be missed on a visit to the German capital. Plus, spring had worked magic, with large green leaves on the trees providing some protection from the near-constant drizzle. 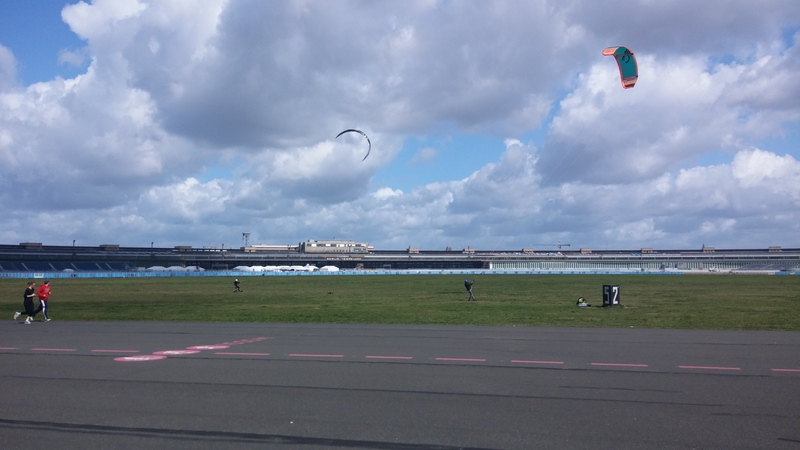 The following morning we set off to continue our ‘green tour’ starting with a long walk around Tempelhofer Feld, a disused airport which had been turned into a park. Bizarrely the airport has been left much as it was, except for the few ‘areas of natural protection’ for bird breeding, the runways and terminals remain. Here you can either take a relaxing morning stroll as we did, go for a long run (our route was 6km, and we criss-crossed a bit), go cycling or roller blading, fly a kite, or even go kite boarding. The airport has a rich history, but is also a favourite in local hearts for hanging out, grilling, relaxing, and getting a bit of space in the big city. Following the tour of the airport and a visit to an adjoining community garden, we visited the ‘Tiergarten’. This is the large park in the centre of the city, visible from the Bundestag and the Brandenburg gate. The trees stand high here, and unlike the open Hyde Park, this is more like a small forest in the middle of the city. Adam was quick to inform me that the name ‘Tiergarten’ (animal garden) was misleading and had nothing to do with the Zoo. Instead, the park was part of an expanse where the King used to go hunting. Nowadays the most abundant prey would likely be mice and pigeons, we noted, as we walked from one end of the park to the other to see the Victory Column. This park was also ideal for joggers and cyclists, especially by mid-morning, as the trees sheltered us from too much sun and heat. The Victory Column is usually seen from afar, a large structure with a golden, winged woman on top. The column actually celebrates victory in several wars: the Danish- Prussian war in 1864 was the war that inspired it, but several others had been won before construction had finished (against the Austrians and the French). Winged ‘Victory’ was not added onto the top until the 1871 ‘unification’ of Germany, and the images around the base feature many different heroic men as well as the female embodiment of the country, ‘Germania’. Standing at her feet, you can look out over the remarkably flat city of Berlin. 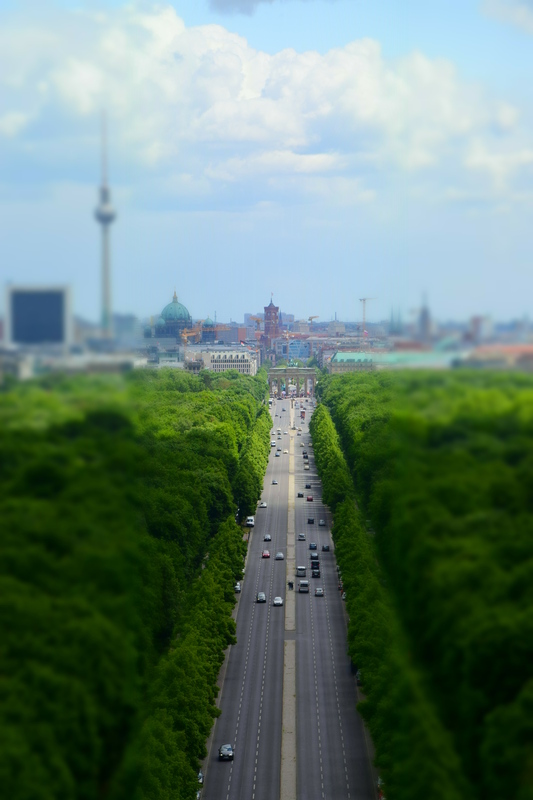 With a great view over the Tiergarten and the river Spree, you can see that Berlin is filled with green oases hidden between houses and office buildings. Walk (or jog!) along the river, or wind your way from the Tiergarten to the actual Zoo, though the forest and past ponds. You might even find the fantastic caterpillars we came across, that had covered an entire garden in fine silk-like webbing. My time in Berlin was (already) coming to an end, and I had been impressed at how many green hideaways there were. If you’re in the area, make sure to take a break from monuments and museums to take a cycle or a stroll in one of these areas and catch a breather!